I’ve been talking about this event for a while so here it is finally … the gluten-free extreme (gfe) cookbook giveaway. Extreme because I’m sharing so many amazing gluten-free cookbooks with you at once. Extreme (for me) because I’m sharing somewhat short and sweet reviews, but all together the shorter posts make for an extreme-ly long post. Remember … I lost all my photos except for recent ones and ones I’d already saved to my blog, so I had to look elsewhere to fill in a few gaps. Extreme because each cookbook below is being given away. There are eight cookbooks, so when the giveaway ends there will be eight lucky and happy gfe readers! Carol is a personal friend. There are many things I adore about her, but count her positive spirit, her sense of humor, and her amazing talents in the kitchen, especially with desserts, at the top of the list! Carol appeared on QVC several months ago when they did a segment on gluten-free products and featured her new book, Simply … Gluten-Free Desserts. While I didn’t personally make any recipes from Carol’s cookbook, I’ve made recipes from her blog before and loved them. I did get to taste a recipe from this cookbook firsthand when Carol did a cooking demo and made her gluten-free, dairy-free Chocolate Pots de Crème. Made with four ingredients only—coconut milk, fine chocolate, vanilla extract, and an egg—this dessert was heavenly! I hear that every other recipe in Carol’s book is, too. Note that this giveaway copy is signed by Carol! Many thanks to Carol and her publisher, St. Martin’s Press! 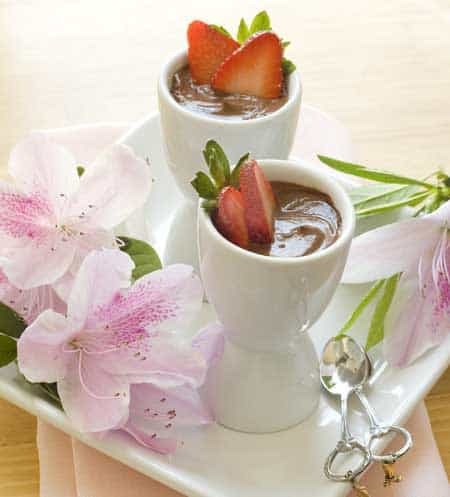 These Chocolate Pots de Creme are a fabulous gluten-free, dairy-free dessert. Make for a special occasion or make any day special by serving them! Bring 2 inches of water to a simmer in large saucepan. Turn the heat to low and keep the water at a bare simmer. Shake the can of coconut milk well and pour into a heatproof mixing bowl set over the saucepan of barely simmering water, without the bottom touching the water. Add the chocolate and melt, stirring occasionally. Once the chocolate has melted, whisk in the vanilla and then the egg. Continue whisking over the heat until the mixture is smooth. Transfer the mixture into a pitcher or spouted measuring cup for easy pouring, and divide among 6 small tea or cappuccino cups or ramekins and chill for 3 hours. The chocolate pots can be made a day ahead. Garnish with fresh berries when serving, if desired. Recipe reprinted courtesy of Carol Kicinski and St. Martin Press. I met Cybele (Cybele Pascal Allergen-Free) for the first time recently. We didn’t get to chat much (it was quite a busy event! ), but she always had a smile for me and everyone else visiting her at the author’s table. Cybele exudes confidence when it comes to baking allergen free, so it’s not really surprising that her very popular baking cookbook garners 5 stars on Amazon. Lucky for you and me, she had a few copies of her Baker’s Handbook left as the event came to a close. I offered to take two off her hands—one for a giveaway for my gfe readers and another one for my support group’s library—and she generously agreed! The subtitle of her book is “How to Bake without Gluten, Wheat, Dairy, Eggs, Soy, Peanuts, Tree nuts, and Sesame.” There are 100 vegan recipes. Sadly, I didn’t get to make any of Cybele’s recipes, but two that I still really want to make are Chocolate Chunk Blondie Bars and Orange Chiffon Cake with Orange Rum Sauce. Note that this giveaway copy is signed by Cybele! This book by Chef Rachel is wonderful. There are 280 pages of 80 gluten-free, dairy-free recipes … ice cream, sauces, and other desserts, and each with several variations. I’d heard about this cookbook since it came out a few years ago—before Chef Rachel sent me a copy to review and offered to sponsor a giveaway. 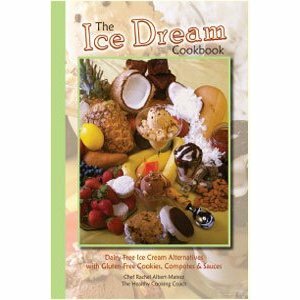 I’ve made one recipe from this cookbook so far … Roasted Banana Rum Ice Dream. When I tasted the results right out of the ice cream maker I couldn’t believe how incredibly good it was. Ice dream indeed, I thought. But I handed Mr. GFE a bowl to get his opinion. I wish I could show you a video of his reaction, but his words and my description of his reaction will have to do. “Woooow,” he responded after his first bite. Then he took another bite. He looked at me with raised eyebrows and quietly, but firmly repeated, “Wow” again. A few minutes later, he said “This stuff is grrreat.” If you’re new to gluten-free, dairy-free, and healthier eating, you’ll especially appreciate that Chef Rachel devotes the first 75 pages to “What You Need to Know to Get Started” … Essential Ingredients & Shopping Tips, Equipment, and Essential Techniques. This cookbook by Chef Rachel is subtitled, A Produce-Dominated Diet & Cookbook. It’s a weighty tome—almost 600 pages! There are three parts: Principles & Practice (history and “preparatory” info to the recipes and meals), The Recipes (divided by category—250 naturally grain free and dairy free), and Appendix (more resources, menu ideas, etc.). This is quite an impressive book. I went for the Practically Paleo Cobb Salad and loved it! This cookbook will definitely have you eating more produce and eating healthier in general, and that’s something most of us are striving for daily. I’ve never been shy about my extreme fondness for Ricki (Ricki Heller) and her amazing recipes. Now she’s come through with the cookbook that everyone is looking for when it comes to breakfasts. Those of us who know Ricki were not surprised to hear that Ellen Degeneres even recommends Ricki’s earlier book, Sweet Freedom. Back to Ricki’s current book, Good Morning! 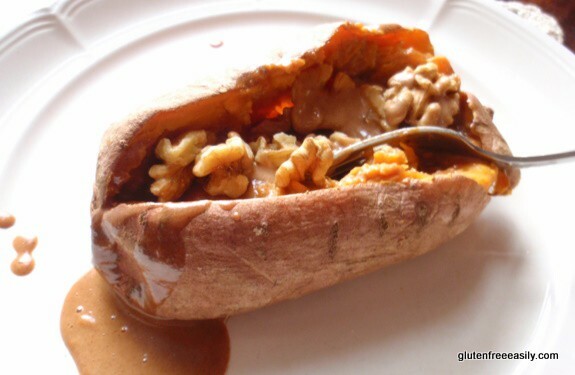 Breakfasts … so far I’ve only made Sweet Potatoes with Sweet Almond Sauce, but oh my, are they good … and good for you—my favorite combo! Most recipes in this cookbook are unique to the book, but here’s one you can find on Ricki’s blog—Giant Upside Down Apple Pancake. I’m a longtime fan of Pete and Kelli’s (No Gluten, No Problem). Their blog was one of the very first I followed when I started reading gluten-free blogs. Just like their debut cookbook, Artisanal Gluten-Free Cooking (which I highly recommend for folks getting started living gluten free, and anyone else who’s gluten free), the second book in their “Artisanal” series does not disappoint. I was lucky enough to be offered a pre-release review and you can actually read my review comment on the back cover of their delightful and appropriately diminutive cupcake cookbook. I’ll share it with you now: “The Bronskis cover all the classic cupcake flavors and then move on to cupcakes that actually make one a bit ‘weak in the knees.’ I mean who can resist cupcakes called Poached Pearfection, French Toast, Hot Fudge Sundae, Orange Dreamsicle, and Dulce de Leche? So put on your apron, grab your muffin tin, and get baking, you’re in for some divine cupcakes!” And I stand behind that. These are definitely some divine cupcakes … and there are color photos of every single recipe. Pete and Kelly use their signature flour mix and other mainstream ingredients like eggs, granulated sugar, butter, sour cream, buttermilk, and cream cheese. But don’t despair if you can’t eat any of those ingredients, because they also include a section in the book titled, “a guide to refined sugar free, dairy free, and egg free baking.” As you would expect, in this section they give the substitutions necessary to make all of their recipes fit any one or all of those requirements—that’s a very nice bonus for those with additional intolerances or preferences! 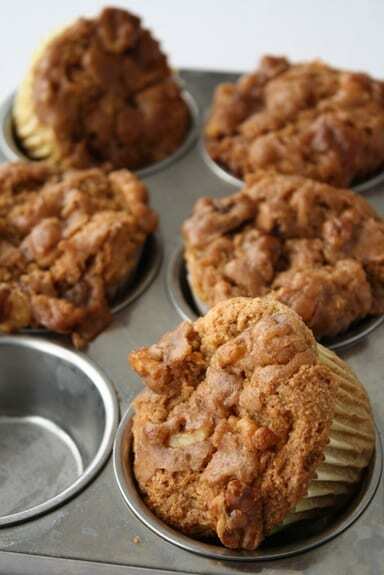 I made their Sweet Potato Walnut Cupcakes most recently. It was easy to make these cupcakes dairy free and refined sugar free using coconut oil, coconut sugar, and coconut yogurt. I’m not sure how the taste compared to the original version, but there was nary any complaining in our house … especially with the “buttery,” sweet, and crunchy topping of walnuts, coconut oil, coconut sugar, and cinnamon. 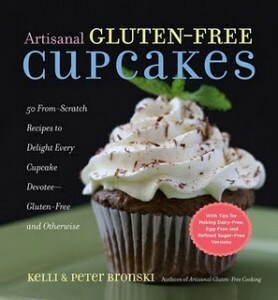 Finally, the giveaway copy of Artisanal Gluten-Free Cupcakes will be signed by both Pete and Kelli! An enthusiastic gfe reader, Deb, sent me an email raving over this book. A week later I received an email asking if I’d like to review the cookbook. I enthusiastically said yes … as long as I could do a giveaway. This cornmeal pizza crust makes this thin crust pizza a little unconventional. The crust is somewhat gritty in texture (in an understated way) due to the texture of the cornmeal and mild in flavor. I think you will enjoy it! In small bowl or cup, briefly beat egg until nearly uniform in color. Add remaining ingredients and mix well to combine. The dough will look like a creamy paste. Spray microwave-safe plate with non-stick cooking spray (or use parchment paper). Spread batter into a 6-inch circle. Remove from plate and cool. Place crust on metal tray or foil, top with your favorite toppings. Finish baking in toaster oven (or conventional oven) at 400 degrees Fahrenheit until cheese is melted and crust is crisp. (If you used parchment paper for microwaving, remove it before baking.) Baking time will be approximately 8 to 10 minutes. From the book Gluten-Free in Five Minutes by Roben Ryberg. Excerpted by arrangement with Da Capo Lifelong, a member of the Perseus Books Group. Copyright (c) 2011. This cookbook from the Portland Gluten Freedom columnist and gluten-free food blogger, Laura Russell—which will be released on August 23—is generating LOTS of excitement, and understandably so. After all, Asian food is one category that requires lots of caution from gluten-free diners. Wheat-based soy sauce is the main culprit in Asian dishes, but personally I’ve also found that gluten-full flour is also added for thickening sauces more and more in Asian dining establishments. Laura gives us the info and the recipes we need to make dishes that are gorgeous, but not difficult. Everyone I’ve chatted with about the book has been initially smitten by the cover photo of Gingery Pork Pot Stickers, also known as Asian dumplings. The rest of the photos in the book are just as tantalizing. Now I must confess that my schedule has not allowed me to make a single recipe … yet. When I make one of Laura’s recipes in the near future; I’ll share (with permission). I’m thinking of these Roasted Pork Meatballs. Reprinted with permission from The Gluten-Free Asian Kitchen: Recipes for Noodles, Dumplings, Sauces, and More. Publishing Group, Berkeley, CA. Photo Credit: Leo Gong. Full disclosure: All copies were complimentary from authors/publishers except for the giveaway copy of Ricki Heller’s Good Morning! Breakfasts. This is an uncompensated post and opinions expressed within are strictly my own. Originally published August 20, 2011; updated August 27, 2018. « Winners of Stephanie O’Dea’s Totally Together: Shortcuts to an Organized Life & Genius Bread & What’s New? Wow, what a great selection! I want the Allergen Free Baker’s Handbook, please please please 🙂 Looks amazing! OOO! They all look awesome, but I’ve had the GF Asian Kitchen on my Amazon wish list for a while now, and would love a copy of that one! thank you for the awesome opportunity! Me, me, me! Pick me! LOL… Seriously any of these look like a great addition to the kitchen! 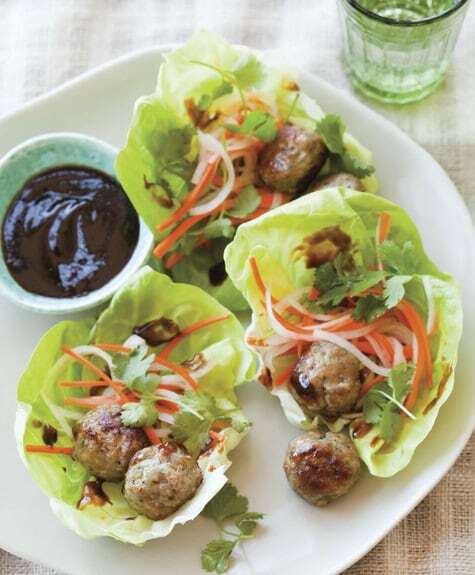 Oh, The Gluten-Free Asian Kitchen…absolutely! I already do a lot of substitutions (because I LOVE asian food) but it would be great to see what a pro does. i posted about the give-away on facebook (and tagged you). again, i’d LOVE the GF Asian Kitchen! The GF Asian Kitchen! Please! Whatever book you choose for me….will be my first GF Cookbook. AND i shared the giveaway on my FB page! I let my eight your old son with Celiac read through the list himself and choose one to wish for and he wants “Artisinal Gluten Free Cupcakes.” If we win it, we will love it. We have the Bronski’s first book and it is fantastic. Thank you for your consideration! Oh how I would love either the Allergen Free Baker’s Handbook or the Simply Gluten Free Desserts!! They all look great. I would love Simply Gluten Free Desserts or Gluten Free in Five Minutes. I would love The Garden of Eating cookbook since I’m eating grain free/gf while I’m losing weight (45 lbs so far!). Looks like that book has lots of recipes with proteins & veggies, which is right up my alley! Thanks for such a great giveaway! All the cookbooks look great,but the “GF in 5 minutes” tops my list !!! wow amazing Shirley!!! I would love Pete & Kelli Bronksi’s book! It’s great that there are so many gf cookbooks out there. It’s about time! I prefer the kind that use regular ingredients, not baby food or other. family of 8, with 3 celiacs in the bunch. It would be very well-used, I can assure you! The Allergen-Free Baker’s Handbook by Cybele Pascal is at the top of my list! I follow you on twitter as heatherbrandt. They all look great – but if I had to pick it would be Simply … Gluten Free Desserts. Love your site and all the encouragement. The garden of Eating would be my first choice. I would love the book “Gluten Free in 5 Minutes”but….any book would do. What a great giveaway.. I am such a huge fan of Carol Kicinski’s and would love her book! I would also love the GF Asian Kitchen… dumplings…yum! Wow, this is an EXTREME-ly amazing giveaway! And thanks so much for including my book! Obviously I have my own book (ha ha) plus a few of the others, but I really *would* love The Garden of Eating! 😉 Thanks for hosting this, Shirley! Awesome. All of the cookbooks look amazing! It would be a thrill to win one!!!! I also follow you on Facebook; I “liked” you a while back. Very useful information. I cook GF for my husband. I DO want them all! Wow Shirley, this is quite the giveaway. The Gluten-Free Asian Kitchen looks awesome. I had not heard of the Garden of Eating before. It’s a close second. Thanks for putting together an awesome giveaway. Any would be great. I’m on a wellness committee at work, and these books would be a tremendous help to food service dept. who serve both staff and students with gf issues. Thanks!! 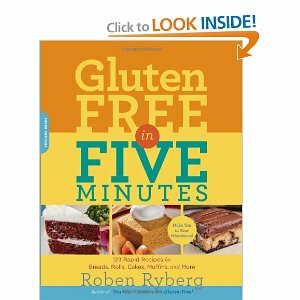 I have Gluten Free in 5 Minutes by Robyn Ryberg and I love the sandwich bread made with sorghum flour! I would also love to win any of the other books! I’d love to win The Allergen-Free Baker’s Handbook. I would like gluten free in five minutes. The Gluten-Free Asian Kitchen sounds wonderful! I miss Chinese, Vietnamese and Thai food so much! I’m a GFE FB fan! I would like The Ice Dream Cookbook. Thanks for this wonderful giveaway. I would enjoy “The Garden of Eating” or “The Allergen-Free Baker’s Handbook.” I just found your blog today on Google, and now follow you on Facebook and Twitter. I’m just starting out with eating gluten-free, so I can use the advice. Thanks. I definitely want them all! I would love to have Gluten free in 5 minutes!! !OR any of them!!! I would LOVE any of the, but “Gluten Free in Five Minutes” really got my attention since those seem to be the hardest things for me to make w/out a lot of planning ahead of time… which I usually forget, so we just go w/out them. Would love to win “Gluten Free in Five Minutes” for my Mom! The GF Asian Kitchen and the GF Cupcakes are at the top of my “to buy” list, but they all look great! Gluten Free in 5 Minutes is at the top of my list! My wife and I are always looking for fast gluten free meals! I of course would love to have all of them, but the one I really want is the Gluten-Free Asian Kitchen by Laura B. Russell. My family loves and misses asian cuisine, and have been looking for a good cookbook. These cookbooks all are amazing, would love to put any of them to good use in my kitchen. I have “liked” you on FB, am now following on Twitter and shared the link on Twitter also! I would love to win! My 5-year old and I are both GF and CF as well including my being anti-candida. This would totally help! 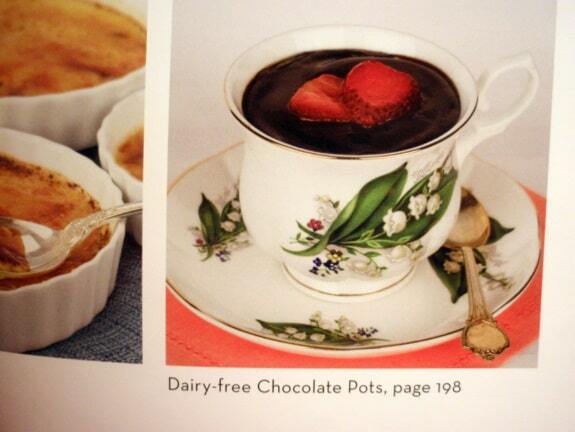 All of the cookbooks look fantastic, but my pick would be Carol’s Simply…Gluten-Free Desserts. Her recipes and photography are fantastic and she’s such a lovely person as well. I would love The Garden of Eating…but any would be great! Simply Gluten Free or the cupcake book…or Cybele’s book…or any of the others….LOL. What a wonderful give away! Would love to win! I have a recipe for chocolate pots but it’s higher carb than the one you posted…which I will be trying with dark chocolate to see how that works out. I can’t imagine it wouldn’t be yummy! The Gluten-Free Asian Kitchen is the book I’d like.With 3 out of 4 people having a different special diet our menu gets boring. We miss Asian food something awful. We would love to win this. I recently found your site and have made some great items from your recipes. Thank you for sharing. I also follow you on Facebook. Would love any of these, especially the Ice Dream Cookbook! Thanks for doing the giveaway! I like GFE on facebook and love your posts! I follow you on twitter and think the GF in 5 minutes would be an awesome cookbook! I’d LOVE the Garden of Eating, but would like any of them. I would love any of these since I LOVE cooking and baking but would especially love the artisanal cupcake one!! Gluten Free Cupcakes would be my choice. Love cupcakes! Cybele Pascale’s Allergen Free book *or* “The Garden of Eating”!! What a wonderful giveaway! I would enjoy “The Garden of Eating” with “Simply…Gluten Free Desserts” a close second. I also subscribed to GFE. I would love to have any of these great books! For me, Gluten-Free in Five Minutes would be awesome! Thanks! The Allergen-Free Baker’s Handbook sounds awesome!! I am interested in the GF in 5 Minutes cookbook to give to my newly gf friend. And I am subscribed to GFE via email. I’d love the breakfast book or a dessert cookbook. Oh my, I would love to add all of these cookbooks to my library! It took me a few visits to read through your extreme post as I didn’t want to miss any of it. My mouth is still watering after looking at all these gorgeous pictures! It is incredible how gluten free cooking has come so far, wish some restaurants would start using these recipes so it would be easier to eat out once in a while. They all sound wonderful but the Asian cookbook would be a first choice and then the 5 Minute gf cookbook sounds interesting. I would love to win the “Gluten Free in Five Minutes” cookbook. I miss being able to make quick and easy meals! I want them all, but especially the 5 minute one. I hope I win Gluten Free in Five Minutes! Or Simply Gluten Free Desserts… they all look wonderful! I already like GFE on Facebook, too! that is pretty extreme! I would love Carol’s book. Her pictures are stunning, and I just haven’t gotten around to buying it yet. How sweet of you to have such a huge giveaway. I am definitely most intrigued by the Gluten Free in Five Minutes cookbook, but I’d love to have any of them. I like “gfe” on Facebook. Thanks! They all sound wonderful! I’d love to try Simply Gluten free desserts! I’d love to have The Gluten Free Asian Kitchen. I must try those meatballs…they look amazing!!! I just want to say, I put all these in my wish list on amazon, at least the ones that were avaiable. they are all awesome! I doubt I will win because I just won the totally amazing book Totally together, which I read cover to cover as soon as I ripped off the packaging! but Its worth a try, these are some a mazing books! I would like the GF Asian Kitchen…but a lot of them sound terrific. I already subscribe to GFE. I would be stoked to get gluten free in five. Sounds amazing! I couldn’t possibly choose between such gluten free fabulousness! They all look and sound amazing. I would love to win any one of the books they all look great but I don’t own so microwave so that one wouldn’t be too handy. I have you ‘ liked’ on facebook. Of course I would like them all, but I would especially love gluten fee in 5 minutes. Being new to gf for my daughter, I need lots of quick recipes since we are usually on the go. My second choice would be a cupcake our dessert cookbook…being 9 yrs old & invited to parties we always ned to bring our own dessert. I’d love to win any except Cybele Pascal’s (which I already own and LOVE!) and the 5-Minute one (I avoid the microwave whenever possible) and the Asian cookbook (we have a soy allergy in the family). The Allergen-Free Baker’s Handbook has been on my “to-buy” list for ages…but since I haven’t had a chance to see many of the others, I’d be excited for any of them! I would absolutely love “Simply…Gluten-Free Desserts”, but all of them look wonderful! Definitely the gluten free asian kitchen. I have been experimenting on my own, but would LOVE this book! wow, what a giveaway, Shirley! I’d love the GF asian one — I have a few of the other ones. Would love to do more “ethnic” dishes for my family — and as you know, I’m not a big into baking. 🙂 have an awesome month!! I want the Gluten-Free in Five Minutes, that’s my kind of cooking! I’m subscribed to you through RSS reader (not email). The Garden of Eating would definitely be my top choice, followed by Ice Dream, then the Allergen Free, then the others fall into place. so many amazing cookbooks! i would love the artisanal gluten-free cupcakes or the good morning! breakfasts, they both sound so great! I’m super excited about Gluten Free in Five Minutes because some nights after a long day of work, trying to fit in exercise and attending sports games I’m just too exhausted too spend a lot of time in the kitchen! What an amazing givaway! My top choice would be the Garden of Eating. It sounds amazing, and I would definitely love to be inspired to eat more veggies and grain-free. 😉 The Gluten Free Asian Kitchen also sounds amazing! Thanks so much for this opportunity to enter. You always have such great resources. I would soooo love to have Any and or all of these cook books. I have five children and all five including my self have recently diagnosed with ciliac and also a dairy and egg allergy. I am finding learning to cook for them very challenging. My kids are very picky and it always has to be fast. These books would be such a help to me. Already a FB fan and love it! My favorite cookbook is Artisanal Gluten Free Cupcakes! I loooove cupcakes! I “like” Gluten Free Easily on Facebook. Following a gluten free vegan diet, Good Morning! Breakfasts Without Gluten, Sugar, Eggs or Dairy is top of my list. 2nd is The Allergen Free Bakers Handbook. The Ice Dream cookbook is at the top of my list (although I’d be happy to win any of them). I am a Mommy of 3 Boys. I would LOVE..LOVE..LOVE the Gluten-Free in 5 Minutes!! I have MANY..MANY Health Issues, so the EASIER it is for Me, the Better!! It will also be nice to Actually EAT and Eat things that taste GOOD!! Thanx & GOOD LUCK to ALL!! Of they all sound great. I actually have The allergens free handbook. I would love to have Gluten Free in 5 Minutes. We have many in our family who need to eat GF. Fast and easy is always good on a buy day. I would love to own ANY of these. Thank you so much for the chance to win one of these. 🙂 I love cooking for my special kiddo! I would love the gluten free Asian Cooking book – we love asian food! Oh man! Such a great giveaway! The books I would love to have the most are: Carol’s GF Desserts, Garden of Eating, Artisanal GF Cupcakes (drool! ), GF in Five Min, or GF Asian Kitchen! All of these books look fantastic! 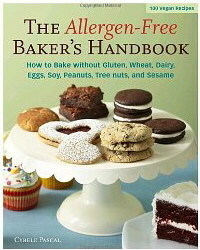 I’d love to win a copy of The Allergen-Free Baker’s Handbook (though most of the other ones look great too!). Oh Shirley!! They all sound like great cookbooks. If I had to choose a favorite, it would be GF in 5 Minutes or GF Asian Kitchen. I thought I would never get to eat pot stickers again. Can’t wait to try that recipe! I recently purchased the Allergen Free Baker’s Handbook after finding it recommended on a post. It has many treats I look forward to making! Woah – hard to pick just one! But I think I’d have to choose “The Garden of Eating” – because it appears to be more my style! That Gluten-Free Asian Kitchen sounds amazing! I would like to have it. OMG – I was away and would have been so mad if I missed this opportunity.. thank you for the long time given to comment. I love them all and having been diagnosed at the same time for Celiac and no Dairy it has been really tough sometimes, then I was told no Soy or Almonds..leaving me with rice milk or Coconut milk. So I could really use some new ideas from some of these books. Much as I would love all of them (or any! ), I would prefer to win “Good Morning! Breakfasts…”. This is a beautiful post! Good job! Would love to win the “Allergen-Free Baker’s Handbook” or “Gluten Free in Five Minutes,” but would be thrilled to win any of the above! They all sound wonderful! I think the GF in 5 Minutes would be my top pick, but I also would love to try the GF Asian Kitchen book as well. Like the last person said – pot stickers!!!! Also. I already follow you via RSS. Hmm, well I already have several of these, but would love GF in 5 minutes! I’d love ANY of these. Surprise me! Any or ALL of them 😉 I especially think the 5 minute cookbook would be just GREAT!!! With so many food intolerances, I’m running out of ideas! Would loooove to win ALL of them! Any of these would be amazing! Thanks for the opportunity! Being that I am new to the gluten-free/dairy-free lifestyle, I was SO excited to see the cookbooks that cater to exactly what I’m looking for!!! Any of these that are both GF and DF would be PERFECT for my new lifestyle. I am very grateful to have found Shirley and her support group. I look forward to learning so much about this amazing lifestyle. Thank you! I am a follower of GFE on Facebook. Love reading the posts! Honestly wish I could have all of them but I am especially excited by The Gluten-Free Asian Kitchen by Laura B. Russell. I would LOVE the Garden of Eating! Truly inspiring! Thank you for this giveaway!!!! Of course any of these would be absolutely wonderful. I am beginning an allergy-free food group in my area and any of these would be great to share with my group. The Allergen-free baker’s handbook would be my preference if I needed to pick one. I would love to have the Gluten Free in 5 minutes cookbook! Great contest idea! Just shared with my friends on Facebook. 🙂 Thank you for the opportunity to share this generous giveaway. Just like your page on facebook. Cannot wait to get posts in future. Would love, love, love the Allergen Free cookbook. I’ve had my eye on it for some time now since my 3 year old DS has multiple food allergies. Otherwise, Good Morning or Ice Dream would be next on my list. Thanks so much for all you do. I would love to win one of these lovely books! The gluten free lifestyle is new to our family. What a tough choice, but I choose ‘The Ice Dream Cookbook’. I ‘like’ you now on FB. So I get to select a second choice? 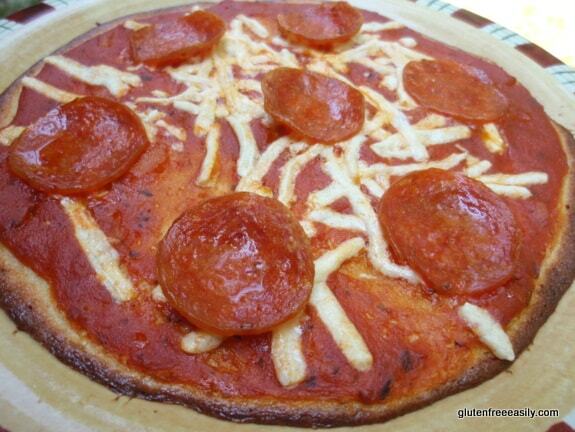 If so, I think ‘Gluten Fre in 5 Minutes’ looks super too!I love how few ingredients are needed for the recipes! I am now subscribed to gfe. Woo hoo! My doctor just told me this morning to go on a gluten-free diet so I’m new at this and any help with any give-a-way would be great help but if I had to chose I’d like: The Gluten-Free Asian Kitchen by Laura B. Russell. GF in 5 minutes. I have all but tis one and the breakfast one. The best GF cookbooks out there!! Thank You!! The Garden of Eating since I need to find ways to add more produce to my diet. Such a great giveaway and an extremely difficult decision on which cookbook – I would be delighted with any of them! Also, I subscribe via email and follow you on FB. Many thanks! So hard to pick just one. It is a toss up between Ricki Heller’s Good Morning! and Rachel Alberts The Garden of Eating. But The Allergen Free Bakers Handbook and Simply gluten free desserts look quite tempting too! I would love to win The Gluten-Free Asian Kitchen by Laura B. Russell or Artisanal Gluten-Free Cupcakes by Pete and Kelli Bronski. seriously they all would be a delight to win. I would be thrilled to win the Garden of Eating!! But if I’m a runner up to that book, I’ll gladly accept the allergen free cookbook 🙂 I’m new to this way of cooking, and have a couple family members who have just been diagnosed with issues. Glad that I found your blog, even if I don’t win a book!! I do want them all! But Roben Ryenberg’s GF in Five Minutes tops my list as a student, so many great recipes but so little time! Gluten free, wheat free, diabetic cooking, all provided my family with cooking challenges, any little bit of help whether from a cookbook or website is really appreciated…. The allergan free bakers handbook sounds great! With an egg, dairy, and peanut allergy in our house ~ The Allergen-Free Baker’s Handbook by Cybele Pascal or ~ Good Morning! 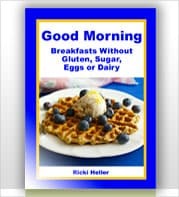 Breakfasts Without Gluten, Sugar, Eggs, or Dairy by Ricki Heller would be great additions to our home. So glad to have found this blog! I ‘liked’ your gfe facebook page! This is an amazing contest! I would love to win the book, The Garden of Eating by Chef Rachel Albert! It looks amazing and full of healthy and delicious recipes for anyone! Great selection of Cookbooks! I am new to GF/DF cooking and baking. Although any of them would be great addition – I would enjoy reading/using The Garden of Eating by Chef Rachel Albert and The Gluten-Free Asian Kitchen by Laura B. Russell. I would love to win all the cookbooks. I’m a subscriber to twitter and facebook. I would love the Artisanal Gluten Free Cupcakes book!! I would love all except the Asian one (I ordered that sucker, just could not wait for Asian food). I would especially LOVE Ricki’s Breakfast book!!! I “LOVE” you on FB!! haha!! It is a toss up between GF Asian or the Five Minute Cookbook. Although any of them would be great! 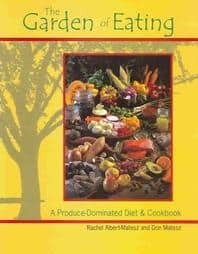 I would really enjoy “The Garden of Eating”…would help me with a very restrictive allergy free diet. Thanks! Pick me. I’ve been subscribingon FB for a long time. Just ordered a vitamix with the grain grinder since I try to cook gluten free. hard to choose but i would love to win The Garden of Eating! Thanks for the extensive review and extreme giveaway. At the top of my list is “Gluten Free in Five Minutes” since I love to spend more time enjoying GF meals with my family than the amount of time it took to make them! Nice Giveaway. I’d love the Gluten Free Asian book or Peter & Kelly Bronski’s cupcake book. I am a faithful follower of @Shirleygfe on twitter. I am a faithful follower of gluten free easily on facebook. I would love any of the books, but the dessert ones would be at the top of my list. I want them all! They all look great! I would take any cookbook except The Allergen-Free Baker’s Handbook by Cybele Pascal – I already own that one. 🙂 Thanks for such a great giveaway! Hi – I follow gfe on FB, am subscribed to gfe, and on the top of my list are two books: The Garden of Eating and Good Morning! Breakfasts Without Gluten, Sugar, Eggs, or Dairy. Thank you so much for this contest! I would love Artisanal gluten-free Cupcakes!! I “like” gfe on facebook!!! The Allergen Free Baker’s Handbook and Simply…Gluten Free Desserts are at the top of my list! OMG, the gluten Free Asian Kitchen is REALLY what I want!!! No NEED! Before Celiac, I ate out at Japanese, Thai and Vietnamese places all of the time. Now, i need to learn to make it at home. Because if you thought getting your GF point across with a server was difficult, well…it is even more difficult when there is a language barrier and they have no clue what you are trying to avoid. Gluten free in 5 minutes. My girlfriend does all the cooking so Id like to find stuff I can make on my own while she’s at work. Gluten Free Asian Kitchen sounds yum! Gluten Free in Five Minutes! I’m a student so I’m on a tight budget and I have no time. I need a new cookbook! Gluten Free in 5 Minutes looks perfect for my niece, but any cookbook would be fantastic. Awesome, Shirley! So many options. I am a cookbook freak (as my last blog post may have alluded to). Thanks for putting together an offering of gluten-free only selections, complete with pictures to boot! I’d love to have a copy of The Gluten-Free Asian Kitchen. Those meatballs look great! But any of these books would be welcome in my kitchen. Subscribed to Gluten-Free Easily via Google Reader. Following Shirley Braden @Shirleygfe on Twitter. Gluten-Free in Five Minutes is on the top of my wish list! Good Morning! Breakfasts Without Gluten, Sugar, Eggs, or Dairy would also be nice. I couldn’t choose…they all looked amazing!! I love cookbooks so I’d take any one of them happily! I shared about the giveaway on my Facebook. Gluten free in 5 minutes would be my first choice! Fantastic! What a lovely giveaway. I’m up for any but would love The Gluten Free Asian Kitchen. yum! Great giveaway pot. I would love to own the Garden of Eating. I also did a “Like” on Facebook. Thanks! Oh my, it’s so awfully hard to choose a favorite. I think I am most intrigued by Ricki Heller’s or Rachel Albert’s books. I love breakfast and the idea of gf as well as dairy and sugar free interests me. Or maybe the Laura Russell one. Lol. So hard to choose. I follow you on Twitter and retweeted your giveaway. Thank you! Hi. Thank you for doing this. I’m 2 weeks in to eliminating gluten and dairy, and still figuring this all out. I would love The Gluten Free Asian Kitchen. I would love either the Allergen Free Baker’s Handbook or The Garden of Eating! Thanks for doing this giveaway! What a great giveaway, Shirley! I am torn between the Garden of Eating and the Gluten Free in Five Minutes (I am a busy mom, I see true value in that one! ), ohhh…and Carol’s Dessert book, and Ricki’s Breakfast book (I have been meaning to buy that one for a while now)…and oh my, does that Artisianal Cupcake book look drool-worthy (that is another on my “I want to buy but haven’t yet” list)…My kids would love the Ice Dream book. I own the rest (and LOVE them! )…I guess you’ll just have to pick for me, lol! I shared on twitter (and am about to tweet it again)! I would love Gluten Free Cupcakes! I have The Gluten Free Asaian Kitchen on my birthday list. I would also love Good Morning or The Cupcake book. I have a copy of Gluten Free in Five Minutes and love it! Thanks for setting up this giveaway! I heard about your website from Sunny B @ andloveittoo. Thank you so much for sharing your talents, information and GF experiences that benefit me and so many others!I would be grateful to win any of the books since I do not have them. If I had to narrow the choices, then it would be ~ The Garden of Eating by Chef Rachel Albert and ~ Good Morning! Breakfasts Without Gluten, Sugar, Eggs, or Dairy by Ricki Heller. I’ve just decided to go gluten free, so any of them would be great! My son was recently diagnosed and is bound for college next year. Gluten Free in Five Minutes– microwave recipes? Heck, I can’t wait to win this cookbook, I need to buy it *right now*!! We would love any of these cookbooks. The Gluten Free Asian Kitchen seems interesting, but winning any of them would be nice!